Pretty quiet villa surrounded by a garden with flowers and a new pool and at 200m from the sea. Ideal for children and couples. Villa in a private and secure area watched over by a security guard. Eat on the terrace by the pool, which is directly connected to the living room and the kitchen. There is a 2nd very large swimming pool (25mx10m) in the residential, for teenagers or swimmers, besides the seaside, next to a golf course and a volleyball court, a swimming pool of 25mx10m for children under 4 years old with a lifeguard. Underpass to go safely from the residential to the beach with your children without having to cross the street. Next the golf course and tennis court. Ste. Maxime: visit Ste. Maxime with its charm, great restaurants, the harbour and its summer attractions. At 15min. on foot from the tennis court and the golf of Beauvallon. 3 private bathrooms for the three bedrooms. Troisème séjour dans cette très agréable villa. Maison spacieuse et confortable, en partie rénovée récemment (chambre, cuisine). Reste quelques aménagements à prévoir pour rafraîchir les sanitaires des chambres. Mooi goed onderhouden en rustige domeine. Ruim huis met alle voorzieningen. Geen airco. Met ons gezin, 3 kinderen, prima tijd gehad. Langs de drukke weg van st tropez naar st Maxime ligt het domaine toch heel rustig. Fietsen en hardlopen goed mogelijk en gereserveerde stranbedjes aan schoon stuk strand. Drukste stukje cote d’azur en heel veel campings rondom.Huisje is mooi. Fijne tuin en heerlijk zwembad. Enige nadeel; geen airco. Wel overal ventilators. We stayed 2014 the second time in this house and felt us very comfortable. 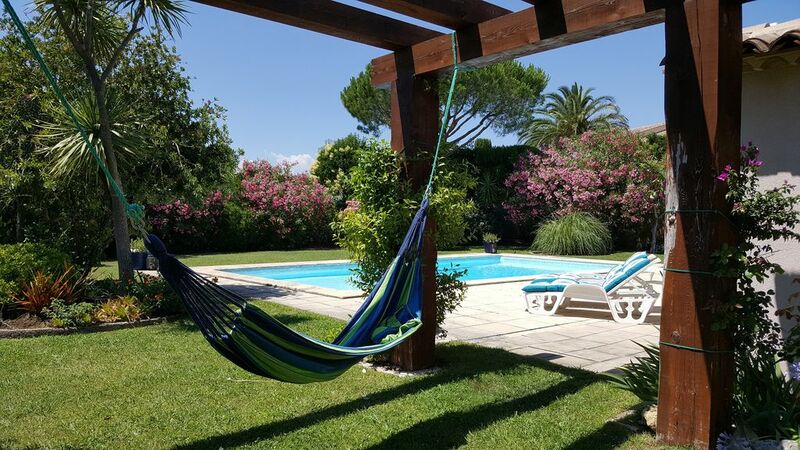 This property is in our view very comfortable: very large and new renovated living area, kitchen, bath room and shower, a large pool with lot of outdoor facilities and beautiful and spacious garden area. We enjoyed the direct access to the private beach reachable by a short walk. So again we spent this year another wonderful holiday at the beautiful Gulf of Saint Tropez. Location bien situee avec un personnel qui s'occupe de la villa, vraiment tres gentils. J'ai personnellement decouvert le fruit du néflier, absolument délicieux! qui pousse dans le jardin. Espace genereux et convivial ou l'on se sent comme a la maison et les repas pris dehors sous l'auvent, etait vraiment super. Nous achetions le "croustillant", ce pain que nous trouvions en allant vers Grimaud. Ce type de pain nous manque tant! La villa était très agréable, spacieuse avec grand jardin privé et très belle piscine. Le domaine de Beauvallon est calme et sécuritaire avec des jeunes. La plage facilement accessible n'était pas trop bondée de gens. La région est magnifique avec multitude de plages et criques à découvrir. Définitivement des vacances formidables et à renouveler. At two hundred metres from the sea and a private beach with free mattresses reserved for the villa in the residential area. At less than 2km from Port-Grimaud, 7km from St. Tropez, 5km from the village of Grimaud and 4km from Ste. Maxim. Golf: The Golf of Beauvallon is very close.